In 1940 Folmer Wisti intiated the creation of the Danish Cultural Institute, then named The Danish Society. What drove him to devote his entire life to furthering the cause of cultural exchange between Denmark and other countries? All his life Folmer Wisti was driven by the desire to meet other cultures. From his young days when he went to the Balkans on a bicycle, till he founded the Foundation for International Understanding as the Danish Society’s Grand Old Man, the open dialogue with the world outside Denmark’s borders was his brand, and equality in the meeting between two cultures was the foundational value. Folmer Wisti was born in 1908, in the town of Vroue in Jutland. His childhood made him acquainted with the psalms of N.F.S. Grundtvig, as well as with the work of a shepherd. But Wisti wasn’t meant to stay in Vroue, he wanted to see the world. When he graduated from high school in 1927 he lived in Copenhagen, but the longing for unknown territory had settled in the young man, so he didn’t stay there for long. Immediately after his exams he went biking through Eastern Europe, all the way to the Balkans. The region was home to a lot of unrest, like it has sadly been in more recent times too. Furthermore that part of the World was rather unknown in Denmark. But Wisti was not deterred. The desire to experience the region had also been stimulated by receiving long letters about it from Folmer’s brother, who worked as a traveling painter in the Balkans. When Wisti set out, he took quite a bike ride – 7.800 km all in all. As a matter of fact he stayed in the region for several years, making a living by writing home about the exotic countries he traveled through, and writing to local publications about Denmark, just as exotic a place to them. In 1931 Folmer Wisti went to Poland. Once there he was caught by a great interest for the country and the language, which led to a period of academic studies. 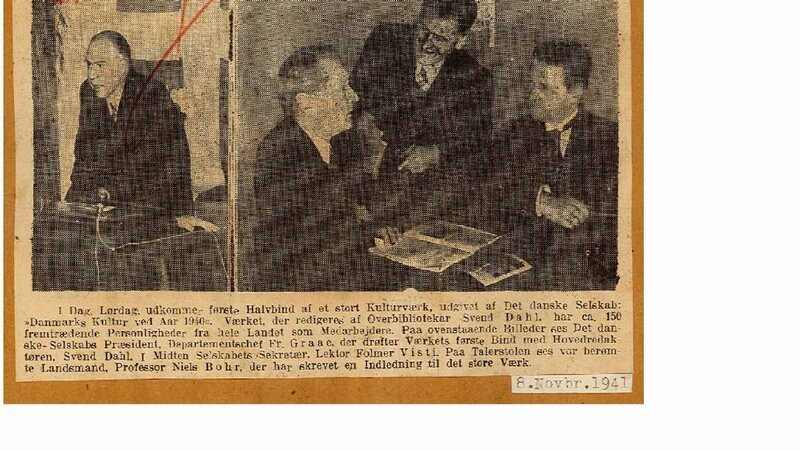 Wisti went back to Denmark to study the Slavic countries at Aahus University, where he took his Master’s degree in 1936. 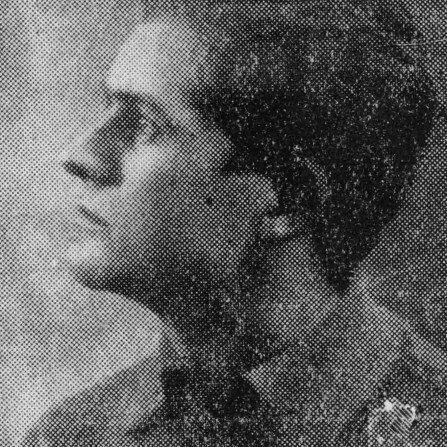 After achieving his degree he traveled abroad once again, to teach Danish culture and language in Poland, first at the University of Krakow, since in Warsaw. During these years Wisti created great Polish interest in Denmark, both by his work at the universities and via a cooperation with the Danish publishing house Gyldendal and Aarhus University Publishing, which made about 2.000 books available to him, free of charge. As early as 1937 a solid result came about from Folmer Wisti’s work in Poland, the founding of a Danish institute in Warsaw. With the library built by Wisti as a cornerstone and Wisti himself in charge, a firm platform was established for spreading knowledge about Denmark in Poland and strengthening the relations between the two countries. But, as history would have it, in 1939 the Nazi occupation force invaded Poland, and the institute was destroyed. By chance, Folmer Wisti was visiting Denmark during the occupation of Poland, and from his country of birth he could follow the atrocities with horror. Folmer Wisti did not let the horrible outbreak of WWII stop him. He began the creation of what would become The Danish Society (The Danish Cultural Institute since 1989) the same year Poland was invaded. The founding meeting was held june 27th, 1940, with Denmark’s first ever Minister of Culture, Julius Bomholt, present, as well as world famous physicist Niels Bohr. Wisti had invited Bohr to come to Poland and give a lecture, when the Danish Institute in Warsaw still existed, and they had struck up a friendship. Bohr described what he felt characterized Danish minds as ”being open towards what is foreign and maintaining our own way”. That fitted the purpose of The Danish Society, which was to fight against hegemony and for mutual cultural relations. The society was to be apolitical and promote the qualities of Danish culture, while helping Denmark find international footing. Because of the war, The Danish Society could not fully function in the early years. More than anything this was a preliminary stage, to make the society ready to help heal the wounds when the war was over. 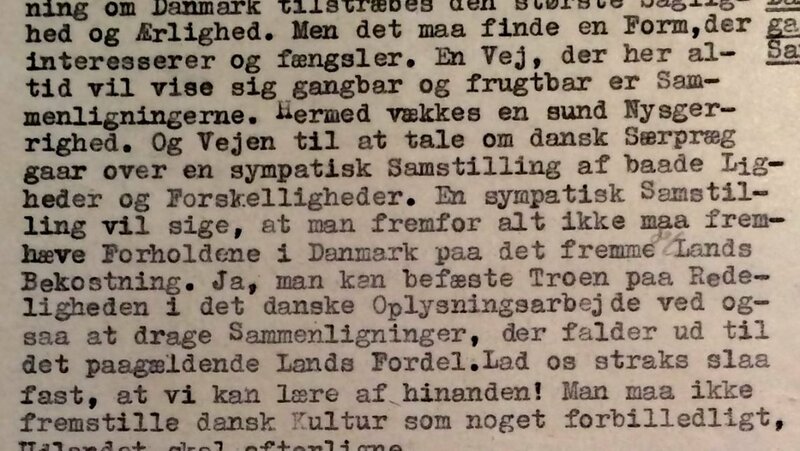 Still, the society contributed to the cultural life and the debate in Denmark even in those early times, with the publishing of the 8 volumes large work The Culture of Denmark in the year 1940. In 1947 the first “information posts” was established in Birmingham, Glasgow, Amsterdam, Zürich, Prague and Chicago. This was the beginning of that international story, that has led to the existence of institutes in many countries over the years. Today there are institutes in China, Russia, Brasil, Poland, Letland, Belgium and the HQ in Denmark. In 1974 The Foundation For International Understanding was established, with the startup capital of 750.000 dkr donated by Folmer Wisti and his wife Helle Wisti. The foundation was to ensure independence in the continual international work in the spirit of The Danish Society and Folmer Wisti. Folmer Wisti did not only leave his foundation and the institution he had been the driving force behind. 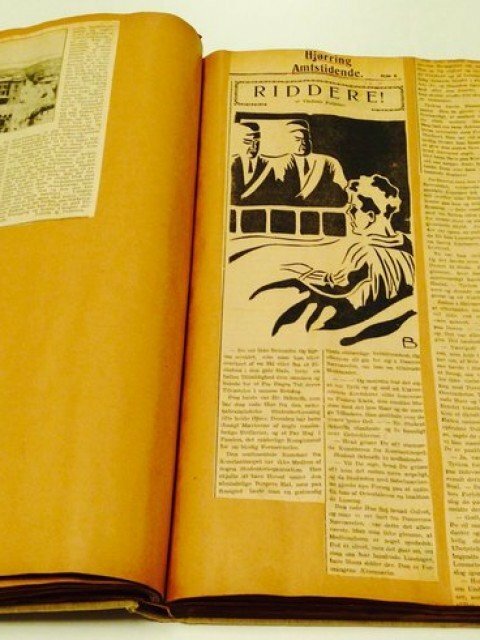 Throughout his years in the Balkans he had collected the articles he got published in a scrapbook. The Wisti couple had shown this scrapbook to the historian Palle Lykke in 1998, but later it had apparently vanished. 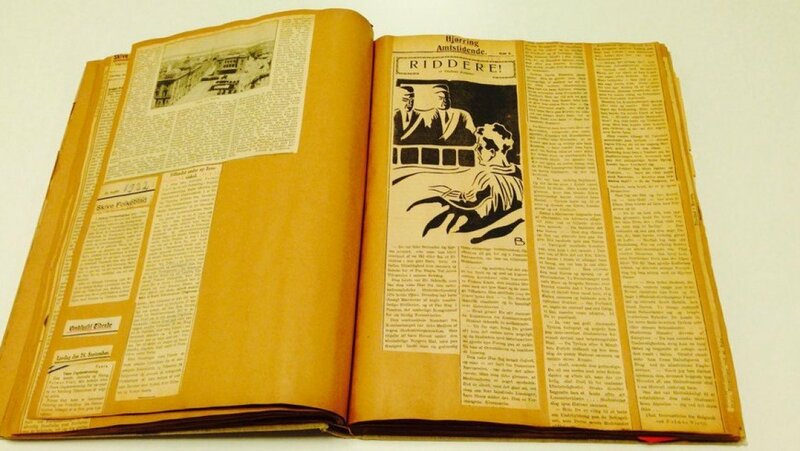 But when the Danish Cultural Institute transferred large parts of its archives to The Royal Library, with the help of Master of Arts Asbjørn Storgaard, the scrapbook reemerged. The library was not interested in the book though, as they did not want any newspaper clippings, so the book was set aside. When it became clear what it was, Aarhus University could not be more happy about receiving the scrapbook, which is now part of AU University History’s collection of Folmer Wisti memorabilia.